How to Setup and Run Calibre for Windows? You can follow this tutorial to setup and run Calibre for your Windows computer. 1. Search and run Calibre on your Windows computer. You see the welcome and setup screen. 2. 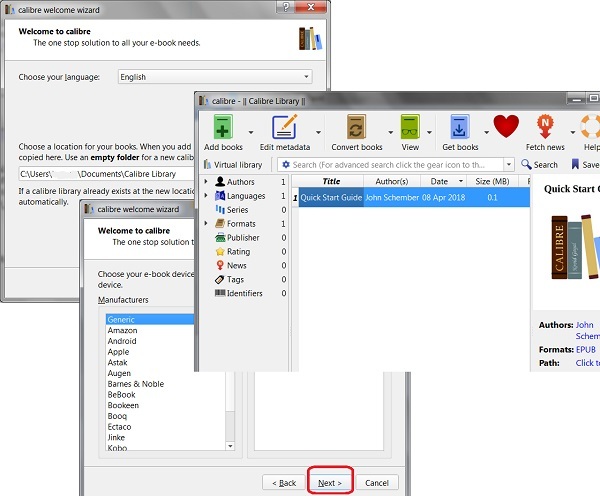 Take the default language and library location, and click Next. You see device setting screen. 3. Take the default device "Generic", and click Next. You see the confirmation screen. 4. Finish the setup. You see the Calibre main screen.